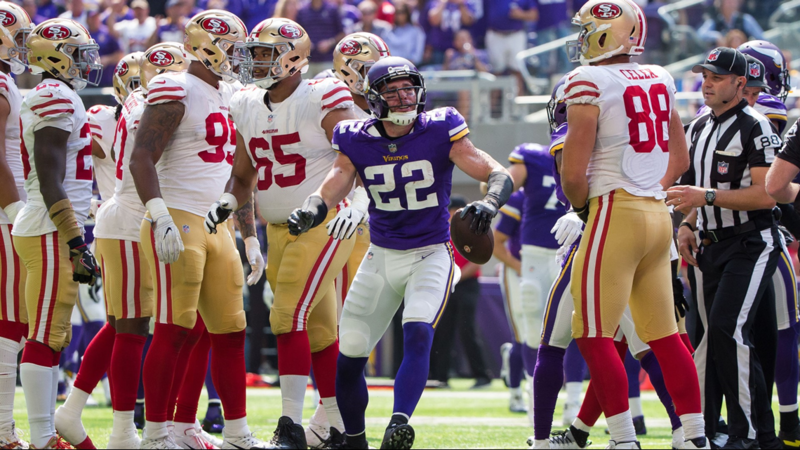 The Vikings forced four turnovers to fuel a 24-16 victory over San Francisco on Sunday. 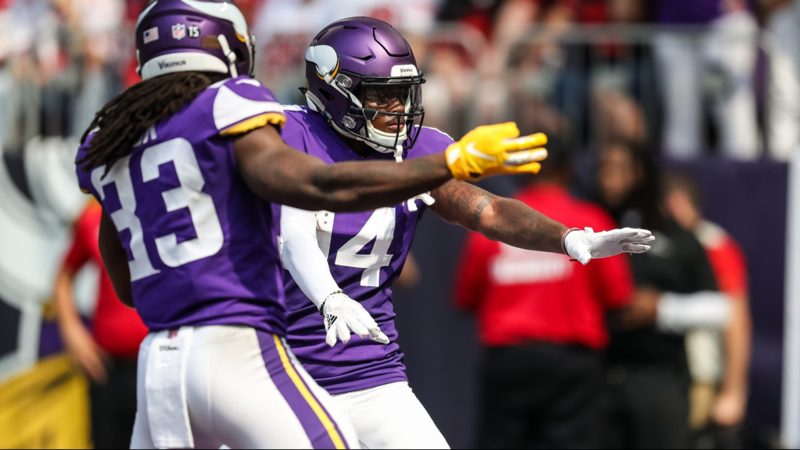 MINNEAPOLIS (AP) - Kirk Cousins passed for two touchdowns in his much-anticipated Minnesota debut, and the Vikings forced four turnovers to fuel a 24-16 victory over San Francisco on Sunday to stick 49ers quarterback Jimmy Garoppolo with his first loss in eight games as an NFL starter. 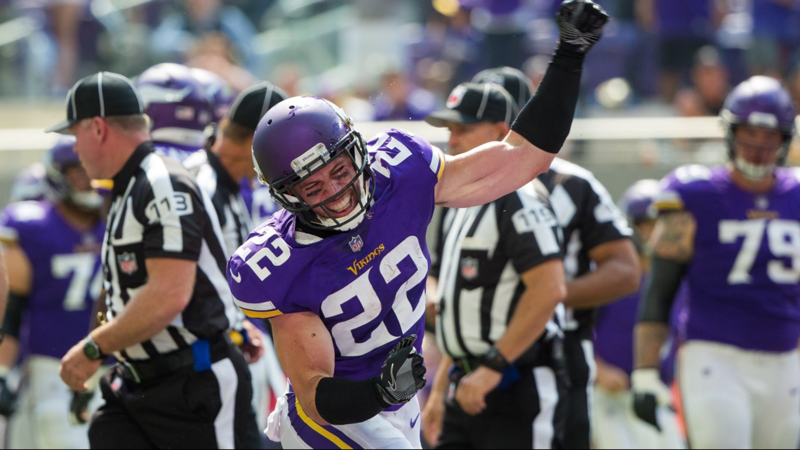 Sep 9, 2018; Minneapolis, MN, USA; Minnesota Vikings defensive back Harrison Smith (22) celebrates a fumble recovery in the second quarter against San Francisco 49ers at U.S. Bank Stadium. 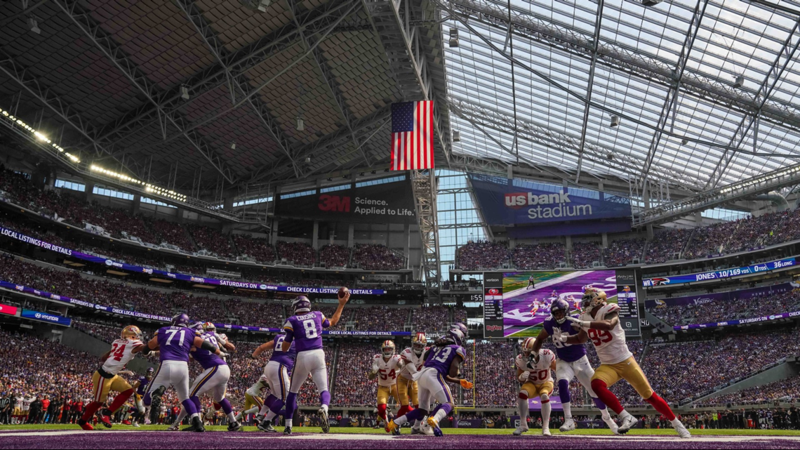 Sep 9, 2018; Minneapolis, MN, USA; A general view as Minnesota Vikings quarterback Kirk Cousins (8) throws during the second quarter against San Francisco 49ers at U.S. Bank Stadium. 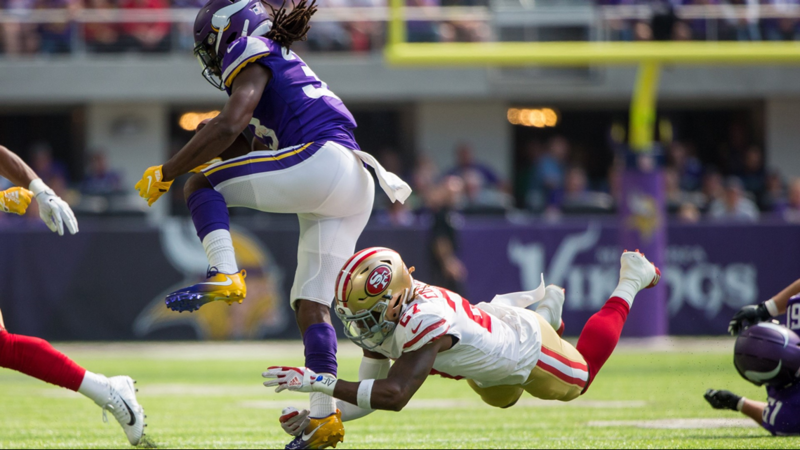 Sep 9, 2018; Minneapolis, MN, USA; Minnesota Vikings running back Dalvin Cook (33) runs with the ball in the second quarter against San Francisco 49ers defensive back Adrian Colbert (27) at U.S. Bank Stadium. 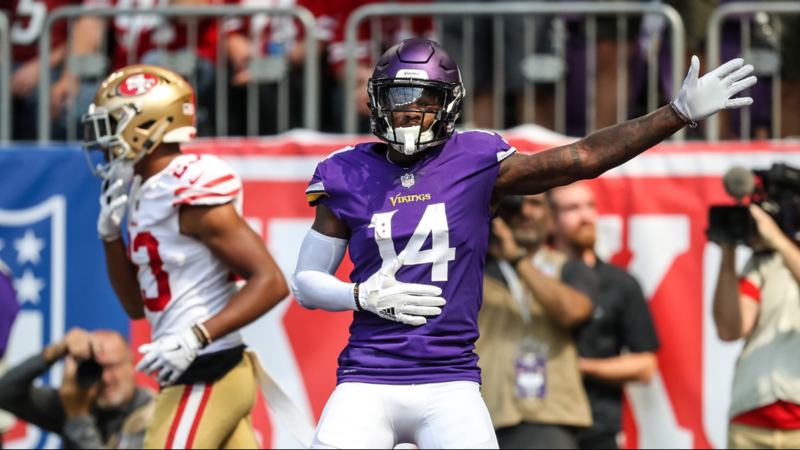 Sep 9, 2018; Minneapolis, MN, USA; Minnesota Vikings wide receiver Stefon Diggs (14) celebrates his touchdown during the second quarter against San Francisco 49ers at U.S. Bank Stadium. 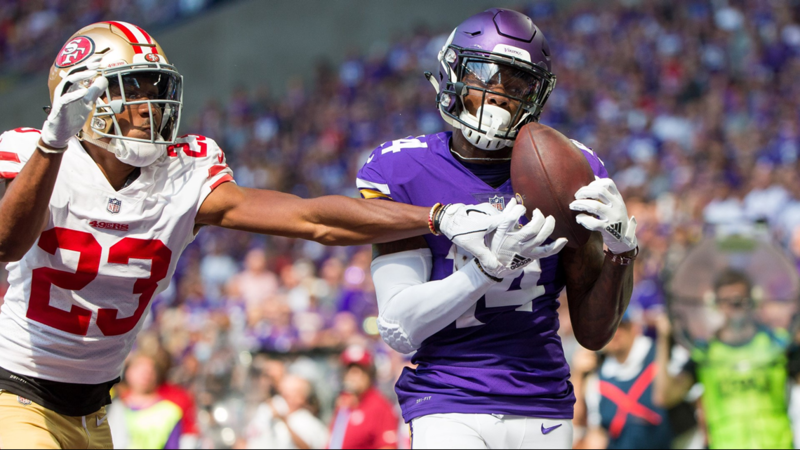 Sep 9, 2018; Minneapolis, MN, USA; Minnesota Vikings wide receiver Stefon Diggs (14) catches a pass for a touchdown in the second quarter against San Francisco 49ers defensive back Ahkello Witherspoon (23) at U.S. Bank Stadium. 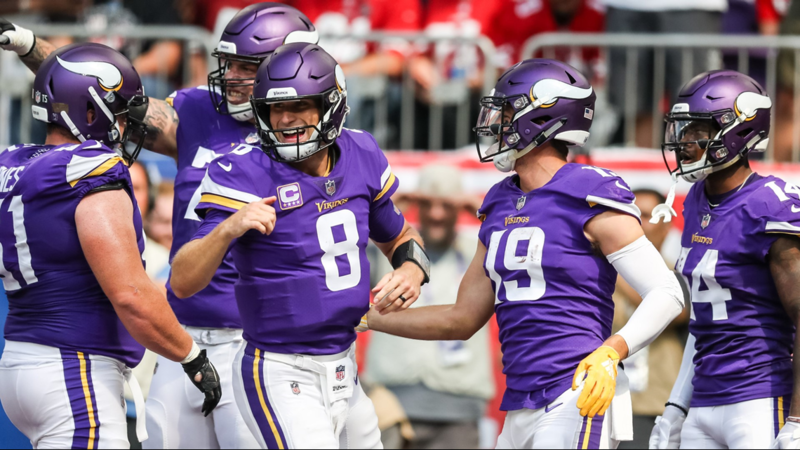 Sep 9, 2018; Minneapolis, MN, USA; Minnesota Vikings quarterback Kirk Cousins (8) celebrates during the second quarter against San Francisco 49ers at U.S. Bank Stadium. 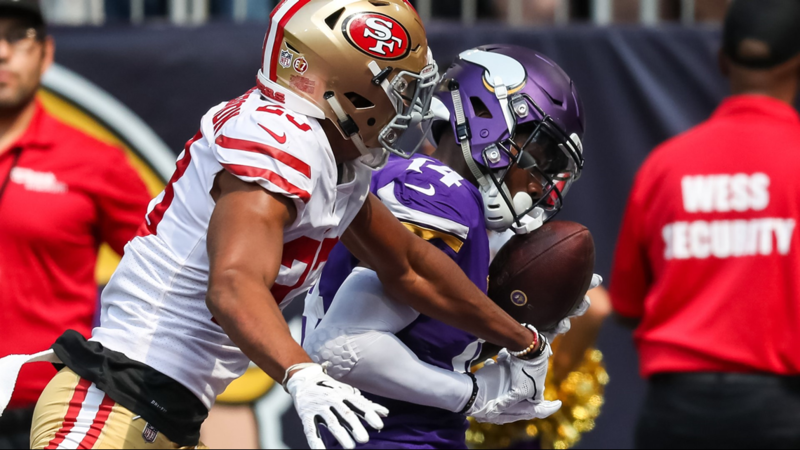 Sep 9, 2018; Minneapolis, MN, USA; Minnesota Vikings wide receiver Stefon Diggs (14) catches a touchdown pass over San Francisco 49ers cornerback Ahkello Witherspoon (23) during the second quarter at U.S. Bank Stadium. 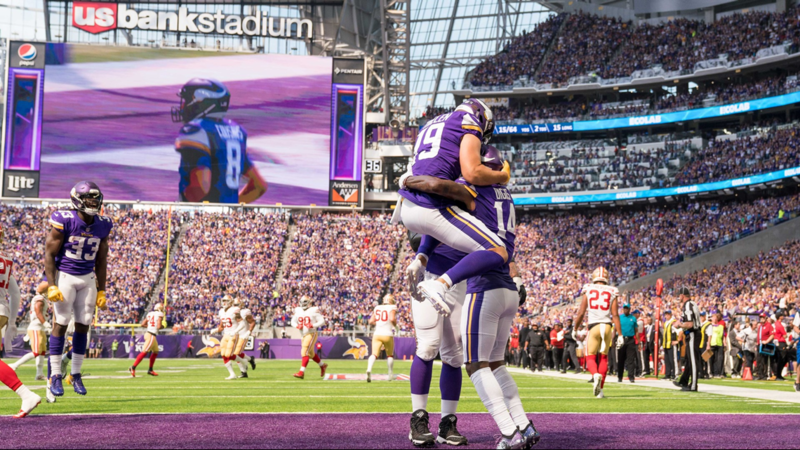 Sep 9, 2018; Minneapolis, MN, USA; Minnesota Vikings wide receiver Adam Thielen (19) celebrates with wide receiver Stefon Diggs (14) after his touchdown in the second quarter against San Francisco 49ers at U.S. Bank Stadium. 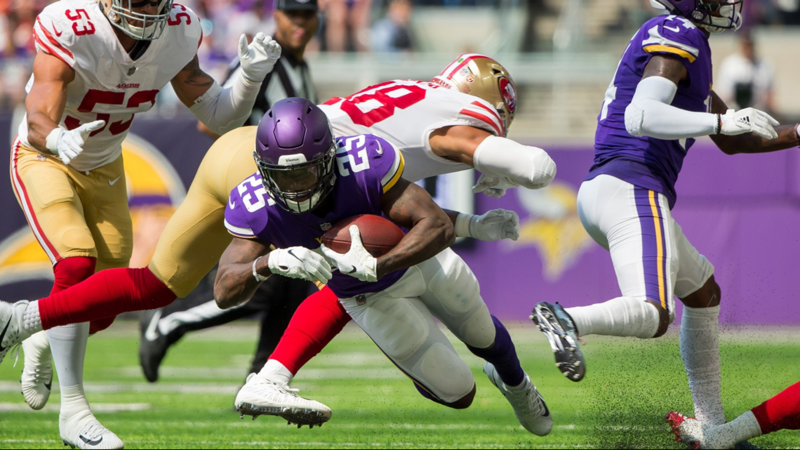 Sep 9, 2018; Minneapolis, MN, USA; Minnesota Vikings running back Latavius Murray (25) runs with the ball in the second quarter against San Francisco 49ers at U.S. Bank Stadium. 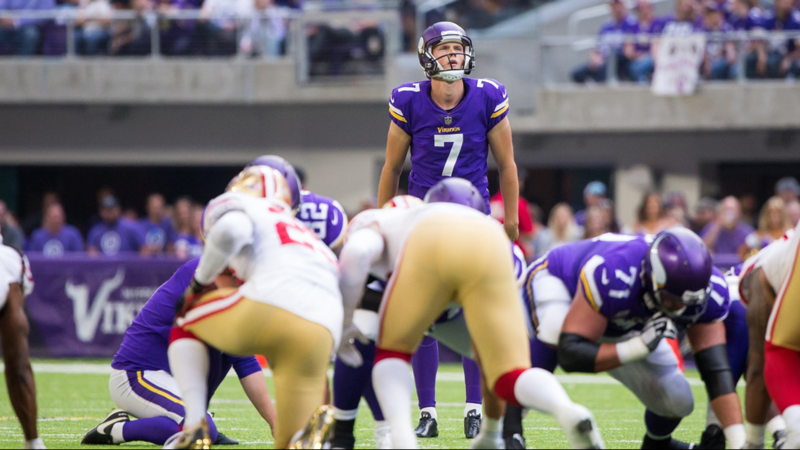 Sep 9, 2018; Minneapolis, MN, USA; Minnesota Vikings kicker Daniel Carlson (7) lines up a field goal in the first quarter against San Francisco 49ers at U.S. Bank Stadium. 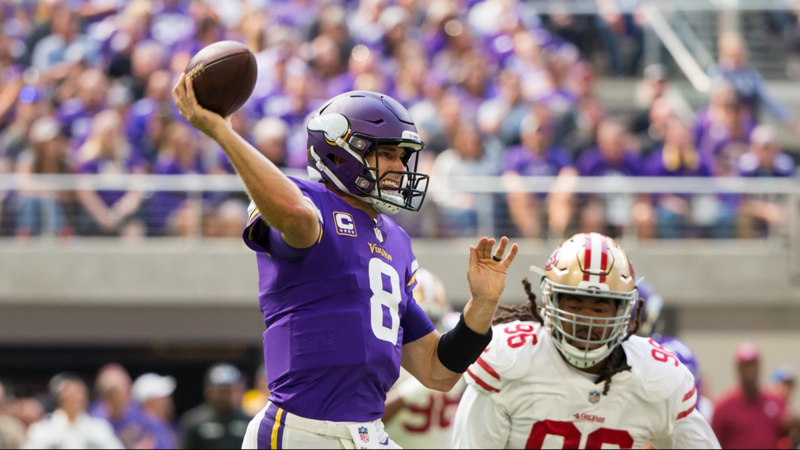 Sep 9, 2018; Minneapolis, MN, USA; Minnesota Vikings quarterback Kirk Cousins (8) passes in the first quarter against San Francisco 49ers at U.S. Bank Stadium. 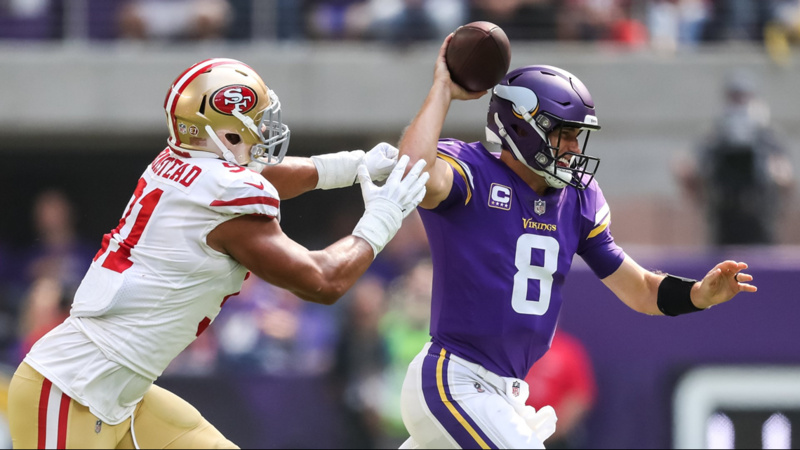 Sep 9, 2018; Minneapolis, MN, USA; Minnesota Vikings quarterback Kirk Cousins (8) is hurried by San Francisco 49ers defensive end Arik Armstead (91) during the first quarter at U.S. Bank Stadium. 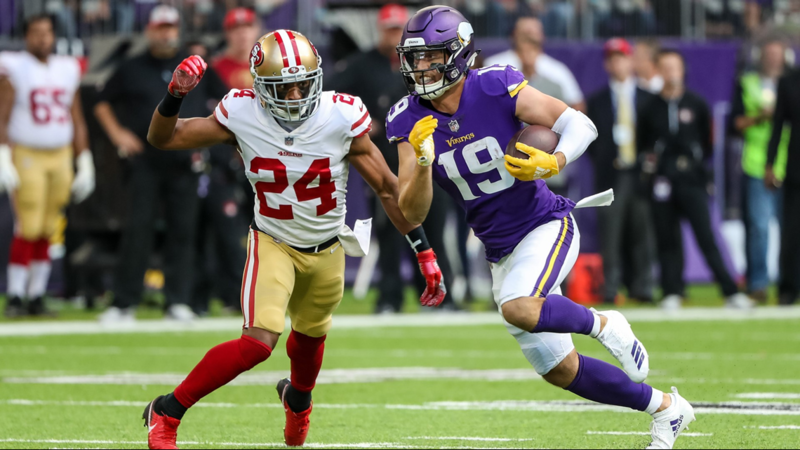 Sep 9, 2018; Minneapolis, MN, USA; Minnesota Vikings wide receiver Adam Thielen (19) runs after the catch in the first quarter against San Francisco 49ers defensive back K'Waun Williams (24) at U.S. Bank Stadium. 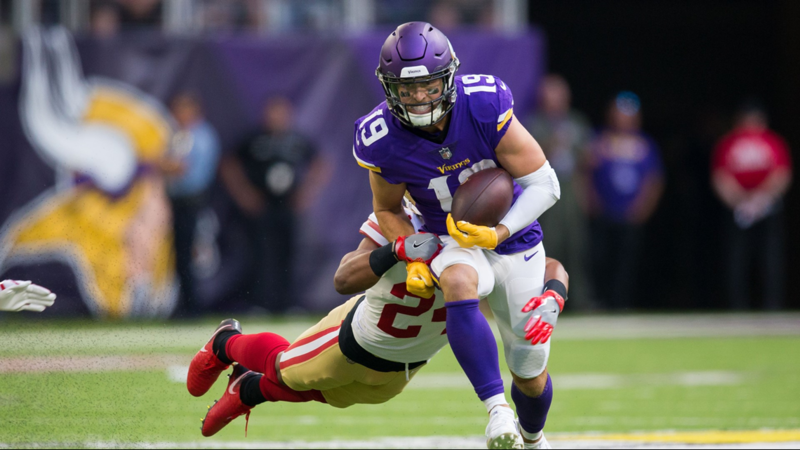 Sep 9, 2018; Minneapolis, MN, USA; Minnesota Vikings wide receiver Adam Thielen (19) is tackled by San Francisco 49ers cornerback K'Waun Williams (24) during the first quarter at U.S. Bank Stadium. 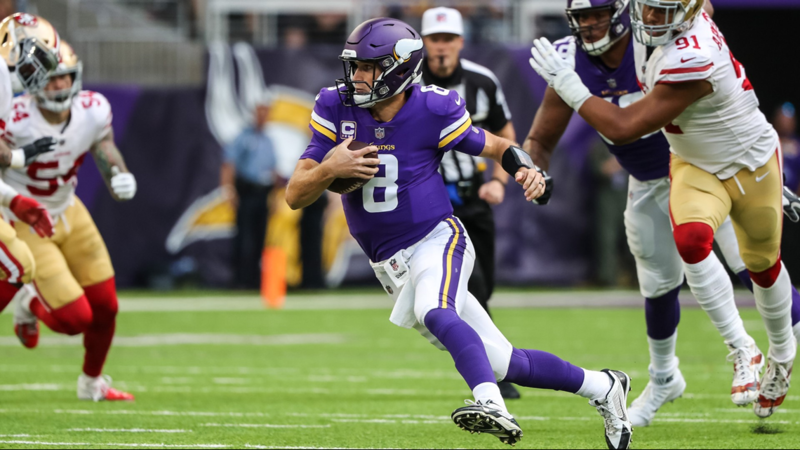 Sep 9, 2018; Minneapolis, MN, USA; Minnesota Vikings quarterback Kirk Cousins (8) runs the ball during the first quarter against San Francisco 49ers at U.S. Bank Stadium. 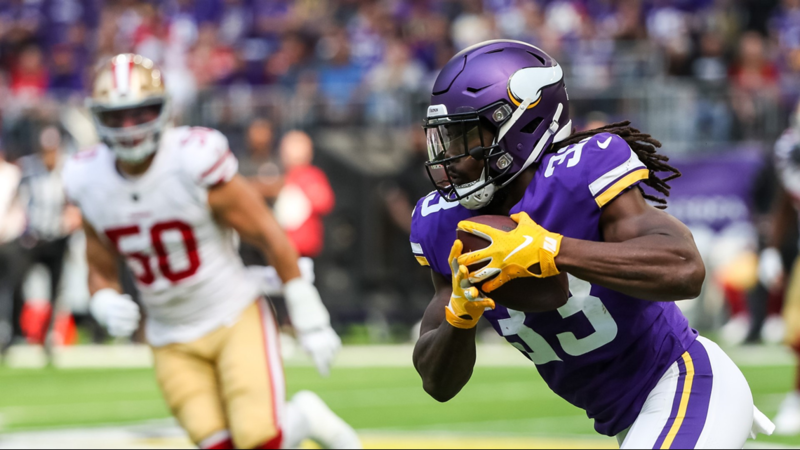 Sep 9, 2018; Minneapolis, MN, USA; Minnesota Vikings running back Dalvin Cook (33) carries the ball during the first quarter against San Francisco 49ers at U.S. Bank Stadium. 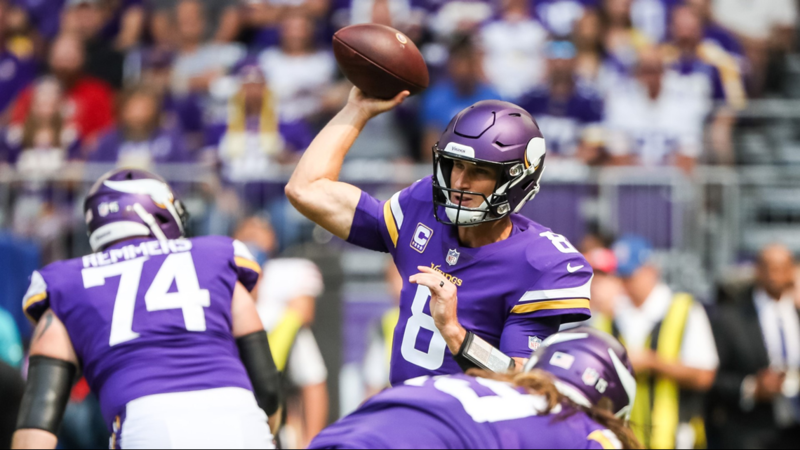 Sep 9, 2018; Minneapolis, MN, USA; Minnesota Vikings quarterback Kirk Cousins (8) throws during the first quarter against San Francisco 49ers at U.S. Bank Stadium. 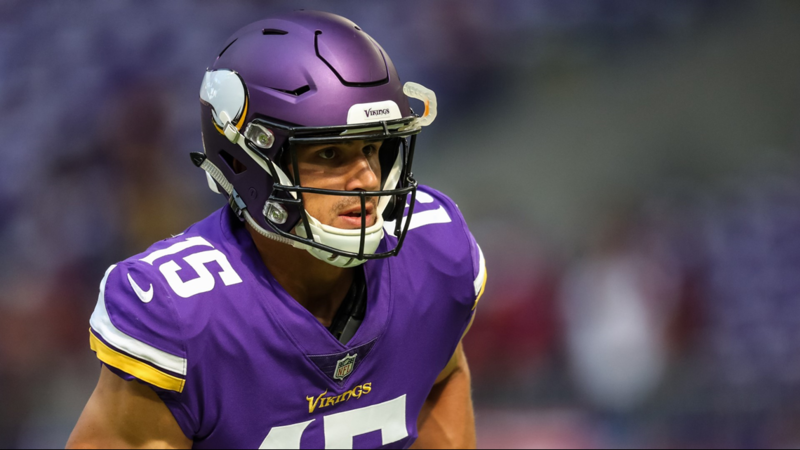 Sep 9, 2018; Minneapolis, MN, USA; Minnesota Vikings wide receiver Brandon Zylstra (15) prior to the game against San Francisco 49ers at U.S. Bank Stadium. 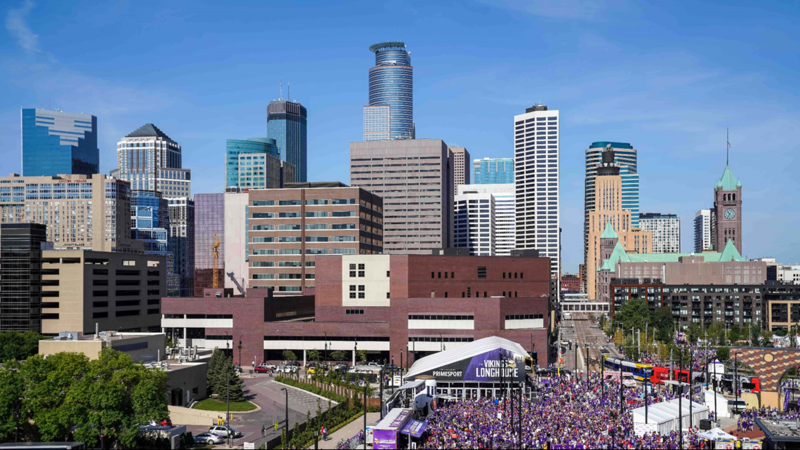 Sep 9, 2018; Minneapolis, MN, USA; Fans gather prior to the game between the Minnesota Vikings and San Francisco 49ers in downtown Minneapolis outside of U.S. Bank Stadium.